Peter Pig games always cover a narrow period in order to capture that period. This is better than some modifications applied to a more generic set of rules. Thus the most important aspects of that war can be modelled and the less important ones subsumed into the general mechanisms. Game setting Two game types in this book. Either battle or siege. Peter Pig games are never two equal sides "bashing it out". Instead the rules generate a new scenarios for each battle. Both players have a fair chance of victory, due to a comprehensive victory point system. Scenario generation for the Battle game. Simple “planning table” upon which players put their resources into “The men”, “Powder and stores”, “The cause” and “Scouting”. The results can make small differences to the situation and armies. Siege game. One player sets out and defends a fortified manor with surrounding earthworks. The other player launches the final assaults. The defences always have a perimeter of 4 feet which can be laid out in many different ways by the defender. This includes being against a table edge or in the middle of the table. The siege differs in that the armies do not use cavalry and do use breach parties and pounding. 15mm ROF should fit on a normal living room table. 4 by 3 feet . Split into 6” squares. Giving a grid of 8 by 6 squares. For 25mm gaming a 6x4 table is needed with the squares being 8” in size. Usually 5 of 6x12" templates per player. Templates include hills, hedges, marsh, road, stream,buildings etc. Scenery is shared, deployed and nudged by D6 rolls. Attacker gets marsh, rough hills, buildings and woods. Defender gets hedges, hills etc. outcomes. Results group around the norm, but extremes are possible. Typically need 8D6 for fights and shooting activities. Peter Pig rules use 3x3 cm bases for most troop types. This size is tactile. has the same frontage when turned through 90’ and allows figure formations to have depth as well as width. 3x3 cm bases for 2,3 or 4 foot figures. 3x4 cm depth for cavalry. Base size is not imperative /mandatory because it is a grid system. A regiment of foot will have 3 bases. 2 of musket(3 or 4 figures per base) and 1 base of pike (4 or 5 figures). Musket and pike ratios can be altered. A cavalry unit will be 2 bases each of 3 figures. A typical army would have 10 units of infantry, 8 of cavalry and some guns and dragoons. Early and late of Royalist and Parliamentarian. Also Covenanter, Montrose and New model army. Army limitations are historical, rather than giving players whatever they fancy. Something simple that can be memorised. PP rules give a move distance worth having. All movement is in multiples of squares. No diagonals. Foot 2 squares, cavalry 4 squares with D6 rolls needed to exit rough scenery. Cavalry should be in action during turn 1. Infantry should strike home in turn 2. This early proximity helps prevent an opponent seeing your great plan and re-deploying his whole army. Shooting takes into account amount , skill and modifiers but ends up with a bunch of D6. Saving roll gets both players engaged. 1D6 per base. Infantry have range 1 and pistoler cavalry can only shoot on faces. 3 regiments of foot in a square all engaging the same target should respect to inflict 2 half base casualties. The PP fight mechanism only consider about 6 modifiers. But these are the important ones for that period. Another reason for keeping the period span small. Then a pile (usually 6- 10 per player) of D6. 5,6 to hit. Various to save. Fight outcome can be win or lose. Losers take additional casualties and fall back. Units tend to rout or stay as a result of morale rather than just losses. Losses are usually in the order of 1 or 2 half bases per turn of fighting. Worst morale throw might be 6D6 when the sky is falling. Most PP games last 6 turns. The games are always alternate move type, but with interaction via saves, reaction and opportunity. 2 Hours. 4 turns each initially. Then a player may stop, then the other player has to pay victory points to extend the game. Usually a few numbers to write down at the beginning but nothing after that. There is a sheet available as a free download on the PP website. The two sides usually have different criteria to win. Most victory conditions are awarded D6 multiples so their exact worth is not known until the game end. Taking the central band of the table and killing his army. Not all PP rules can be played with all figure sizes. Usually the rules are written for 15mm. Some bigger sizes such as 18/20mm can use the same basing and measurement without any change needed. In 25mm use a bigger grid size. 8 inches would make the battle field 4 feet by 5 and a bit feet. Base size does not matter as it is an area game. PP likes to provide a one stop shop. Buildings , walls and hedges are available from PP too. Using a gifted general to allow a re-roll in certain situations. Sabots have been made by Warbases to enable quicker movement. 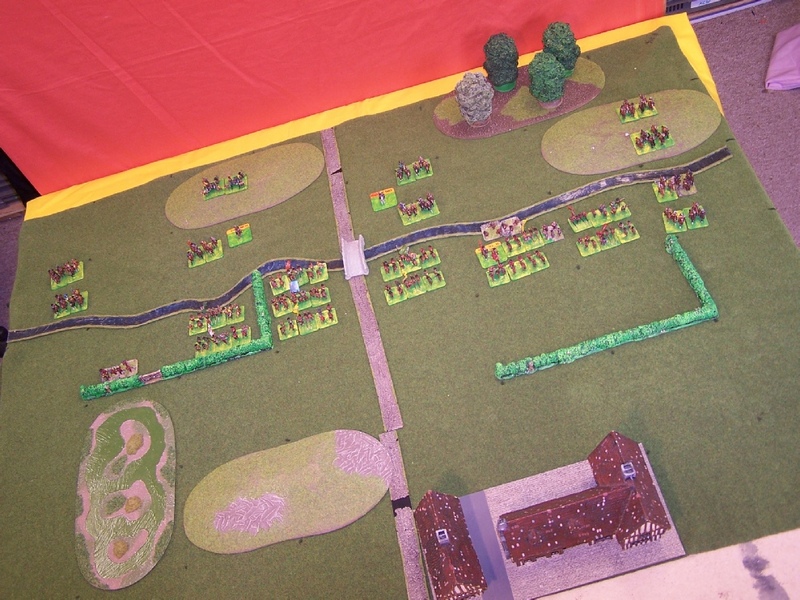 Kerr and King have made scenery for the siege games.